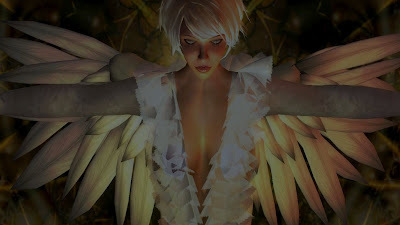 Just for fun, I will give $100L to anyone who posts a photograph of themselves wearing these wings (not any others!) as a Flickr comment to my photograph (below), which I've posted on Flickr, by May 3rd. * Find one of the incredible promotional triptychs for the Garden of NPIRL Delights created by Rezzable Productions for this build festival, anywhere on the grid. * If you ask me where you might find a triptych, or contact me in ANY way with ANY question regarding this $100L giveaway, you will be immediately disqualified. The idea is that you seek it out. What would be a logical place for you to find it? * Accept these wings by Kaeli Candour from that generous object. They are free, and come with a few other great goodies. * Photograph yourself in them. You do not have to copy my posture in the photograph above. In fact, I look forward to seeing what you come up with! Importantly, it should be easy to see that the wings you are wearing are the ones given out by the triptych. * Post your pic on Flickr (you will need a Flickr account to participate, and Flickr accounts are free). * Go to the "all sizes" menu above your photograph, select "small" and copy the html code. * Go to my photograph on Flickr here, and add that html code to the comment box, and make sure I have your in-world name. * One prize per participant. * Good till Saturday, May 3, 2008, 11:59pm SLT. Do you work for Flickr? This persuaded me to finally sign up even though I use google for everything. Hallo, Kanomi! I most definitely *do not* work for Flickr, though that is an excellent company. I like Flickr's compatability with Second Life, and so do thousands and thousands of others, as can be seen by the membership in the Second Life group there, alone. There are dozens (hundreds?) of Second Life photo groups on Flickr, too. It's fun!